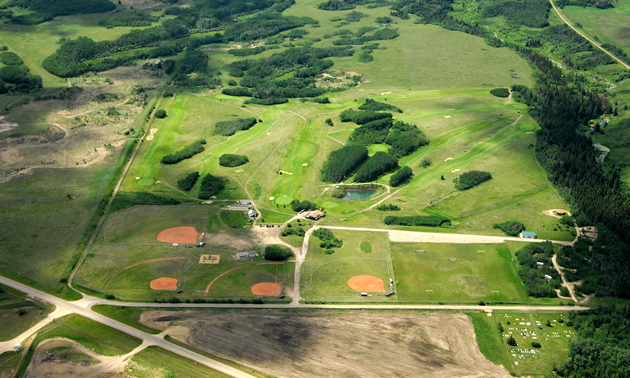 Initially beginning with sand greens in the 1950s, Elk Point Golf and Country Club has been a centre of the community since before the area was even dubbed an official town. As the years went on, more recreational facilities began to be installed—including grass greens for the course in 1992—and the complex is now a hub for many small town activities. Millar said the course workers are also a very tight-knit community, as Elk Point runs primarily through the efforts of volunteers. Though the 9-hole course is rather small, it hosts a large number of events throughout the season in order to give back to the people of Elk Point. Two of the biggest fundraisers hosted by Elk Point are for STARS (Shock Trauma Air Rescue Society), and Haying in the 30’s—a local organization that helps out families dealing with cancer. Millar said that each year the club raises approximately $20,000 for STARS, a pattern that he hopes will continue well into the future. Though volunteers are constantly busy with events and tournaments throughout the year, Millar said the course always maintains a low-key and friendly feel. Two kilometres west of Elk Point, off secondary highway 646. Reopened driving range, added tee boxes to Hole 4.